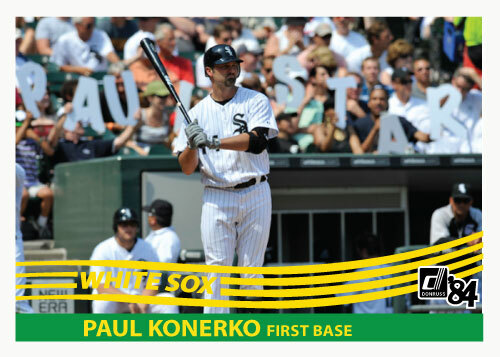 Here is a special card for csd, A Paul Konerko 1984 Donruss. It is the landscape version, as an added bonus it features the fans spelling “Paul-Star” in the background. I really wanted Alex Gordon to win that vote but even I will admit Konerko deserved it more. He has better stats and I feel like the Chicago fans did a great job in promoting him for it. Alex Gordon gets major points for his defense as well but Paul Konerko flat out deserved to be in the All-Star game. 1983 Topps is a great design. The card on the left represents the actual colors for the Chicago White Sox cards of that year. I think it looks pretty bad. I know they were trying to create more color on the cards but it made it look ugly. So on the right is the card I picked the colors for. I think it is better, it may be bland but it at least matches the White Sox colors a little bit. Adam Dunn in a way replaced my favorite active player. 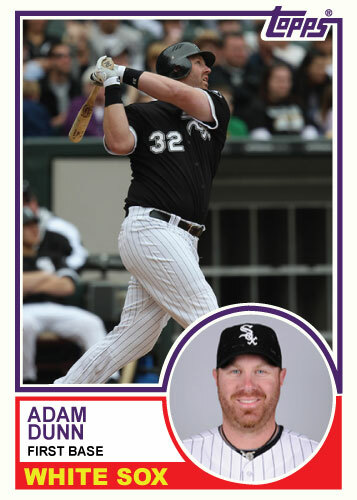 This season the Chicago White Sox signed Dunn as a free agent this off-season to pretty much fill a designated hitter roll. This role was vacated by Jim Thome before last season. Ozzie Guillen made a bad decision last year by thinking he could use several players in that role. I don’t think it worked well and the White Sox signed Dunn for this year. Thome is now a Minnesota Twin and is similar to the type of player Dunn is. Adam Dunn has yet to create the impact that Thome did for that team. I think Dunn will get hot sometime this year, likely when he plays the Royals a lot. This is a White Sox card and you should visit CSD’s custom cards if you like the White Sox cards. There is also a lot of draft cards going up over there right now so be sure to go check out CSD’s.